Johann Friedrich Bottger (1682 to 1719) and his place in the origins of Meissen Porcelain. Johann Friedrich Bottger, an alchemist, discovered porcelain after being held under house arrest in 1700 by order of Augustus the Strong, the elector of Saxony. Although the 18-year-old Johann Bottger had committed no crime, Augustus had heard that the young man was an alchemist hoping to create gold from base metals. If gold was to be made, Augustus wanted the secret for himself. Bottger was kept a prisoner in Dresden, carrying on his fruitless experiments and despite desperate attempts to escape he was always captured and brought back. This was an impossible predicament and eventually a solution was suggested by a Dresden scientist Ehrenfried Walter von Tschirnhaus. von Tschirnhaus had spent the previous twenty years attempting to discover the secret of true porcelain, (another obsession of Augustus). He had made considerable progress, but not sufficient to produce wares on a reliable basis. Recognising Bottger’s talent, he suggested that they join forces and concentrate on a realistic quest rather than the alchemist’s hopeless pursuit of gold. 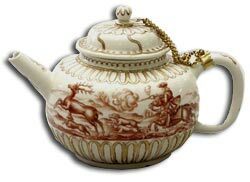 Porcelain had been made in China since the 14th century and it created a sensation when it was brought to Europe. No-one had ever seen such white semi-translucent pottery. People paid high prices for it and, despite many trials; the secret of its manufacture was still unknown at the beginning of the 18th century. Johann Friedrich Bottger is generally acknowledged as the inventor of European porcelain and although more recent sources ascribe this to Ehrenfried Walther von Tschirnhaus, Bottger is still credited with the Meissen porcelain manufacturing process. In 1705, Bottger, still under guard, was moved to meissen to work with Tschirnhaus. The work was interrupted for a year when the Swedes occuppied Saxony in 1706 and Bottger was moved to a distant fortress for safe keeping. In 1707, Bottger was returned to Dresden, where a laboratory was established for him in another fortress. Tschirnhaus died on October 11th 1708 from dysentery. In 1708, a practical formula was produced and production began in the Dresden laboratories in 1709. The first pieces went on sale at the Leipzig Easter Fair in 1710. Augustus finished building a royal porcelain factory in Meissen in June the same year and the operation was transferred there. The first wares were red and are now known as Böttger stoneware. By 1713 Meissen was producing delicate white porcelain and coloured glazes followed within the next few years. Bottger was passionately proud of his creations. He inspired Augustus with his vision of pieces designed by leading artists to out perform even the Chinese, and his achievement in this field gave Saxony its greatest single distinction. Yet he directed the Meissen factory from confinement in Dresden. He had the luxury of a house in the fortress, but there were guards on the door. Augustus, his tyrannical employer, remained resentful that he had been fobbed off with porcelain rather than gold, but finally released Böttger in 1714. In 1719, Johann Friedrick Bottger was still in his early thirties, when he became extremely ill and died. While production of Meissen porcelain started successfully, Augustus never made money from the factory as he bought most of the best pieces to add to his own collection. 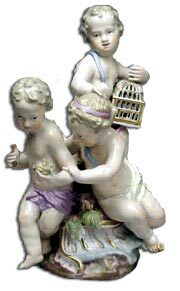 Inevitably, Bottger’s great secret of porcelain manufacture escaped and other European factories started to manufacture this magical material, but Meissen porcelain was the first and is still the best quality and most famous.